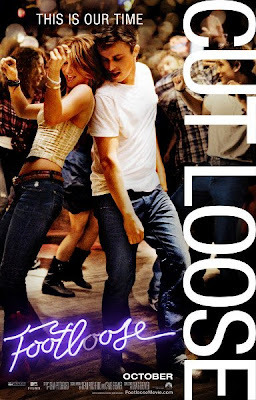 There have been a lot of remakes and reboots in 2011 so far, but the most fun has to be Footloose. The original, with such household names as Kevin Bacon, Sarah Jessica Parker, John Lithgow, and Dianne Wiest, came out in 1984, and was a great movie, so a lot of skeptics were worried that the new Footloose wouldn't live up to the original. This film definitely pays homage to the former version in some scenes, while making it more modern, and the dancing scenes in it are phenomenal. Ren McCormack (Kenny Wormald, "Center Stage: Turn It Up") moves from Boston to the small town of Bomont to live with his aunt and uncle (Ray McKinnon, "Dolphin Tale") after his mother passes away. Bomont is very different from Boston, and they have a law that says that no minor shall engage in public dancing, which is a problem for Kenny since he loves to dance. When he meets the preacher's daughter, Ariel (Julianne Hough, "Burlesque"), he finds that she and her friends like to dance too, and he decides to make a motion to overturn the dance ban. The preacher (Dennis Quaid, "Soul Surfer") doesn't want this to happen, however, and he soon finds himself butting heads with Ren. Kenny Wormald, a relatively unknown actor, proves to be a fantastic dancer, and he and the rest of the cast work hard at making this movie just as good, if not better than, the original. The supporting cast are all great dancers as well, and the dancing scenes in this film are among the film's strongest; otherwise, some of the scenes takes a turn for the sappy, but luckily there are not many of these. If you look at Kenny's IMDb page, he is from Boston, like his character, and he has been dancing ever since he was a little boy, so he is perfect for this role. Yes, see this film. Even the staunchest supporters of the 1984 version will enjoy this new remake, and there are definitely some scenes that are word-for-word from the original; in the scene where Ariel (Julianne Hough) prepares to go to the dance, near the end of the film, she is wearing a dress that looks eerily familiar to the one that Lori Singer (the former Ariel) wore, and she even adjusts the dress straps in the same way. If anything, the new Footloose is a bit more country (that is to say, it incorporates more country music) than its predecessor, and the film has great energy and fantastic dancing scenes, including one or two that include the "Footloose! Footloose! Kick off your Sunday shoes!" theme song of sorts that was so prevalent in the '84 version. Footloose is in theaters today, October 14th, and is rated PG-13 with a runtime of 113 minutes. Click here to see my interview with star Kenny Wormald.